← Spending time on the Cape. Missing in Action – or – Doesn’t everyone shop for fabric on vacation? You may have noticed that I’ve not posted anything for almost two weeks. Mr. Fifty Dresses and I have been away on the West Coast, enjoying some time with our grown son, and seeing some of the majestic scenery in the states of California and Oregon. 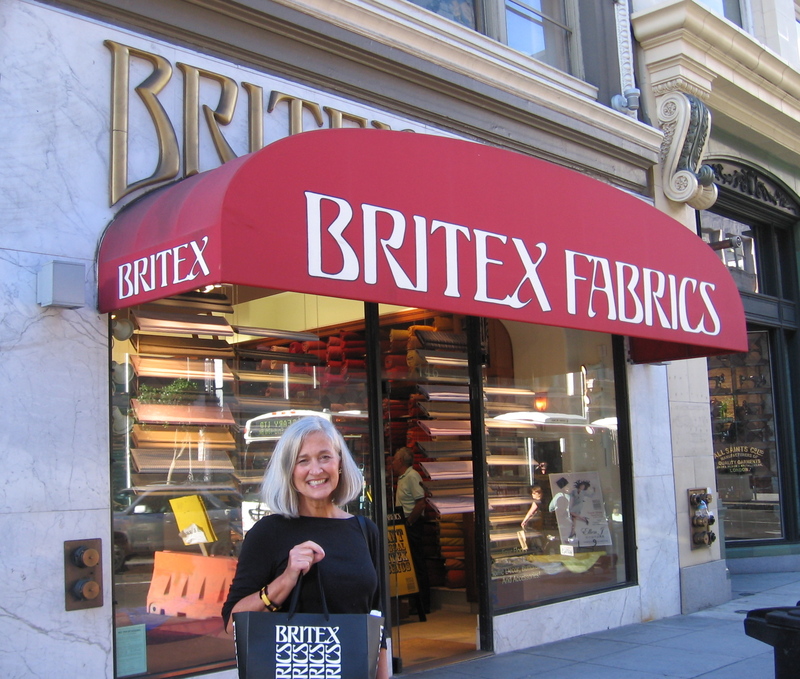 Of course, one of the best places to enjoy colorful scenery is always in Britex Fabrics on Geary Street in San Francisco. My husband and son know by now that no trip to California is complete without fabric shopping! I am all smiles with my newly-made purchase! I am wearing “my very styish pants” and was delighted to get complimented on them in the store. This fabric will be a jacket, and I want to make a pink skirt to make it into a “dressy suit”. That pink is a tricky color, I’ve discovered. I’ve ordered many swatches, thinking one of them will be “it” and it never was. So I tucked that pink and black houndstooth- checked wool sample into my carry-on bag so that I could enlist the experts at Britex to assist me. The bolted wools and silks and designer fabrics are on the first floor, and it did not take long for me to accept Douglas’ kind offer of help. 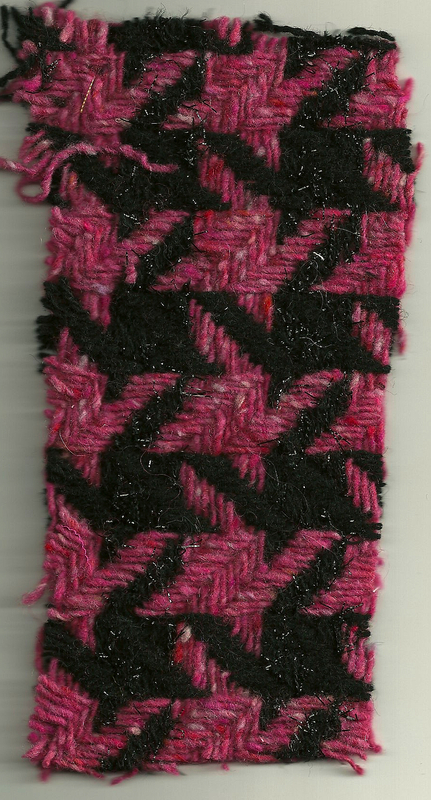 We looked first at the wools, one beautiful bolt after another, but none that totally complimented the pink. Next we moved to the silks – and there we struck gold – or perhaps I should say pink gold. As soon as Douglas pulled out this silk shantung, we knew the color was right. We carefully checked the color inside and then took it outside on the steps to check it in sunlight. Perfect, both places. Being shantung, it has the correct heft to accompany the wool, but it is light enough to be used for attached trim if I choose to add it around the collar, down the front, and at the bottom of the sleeves. 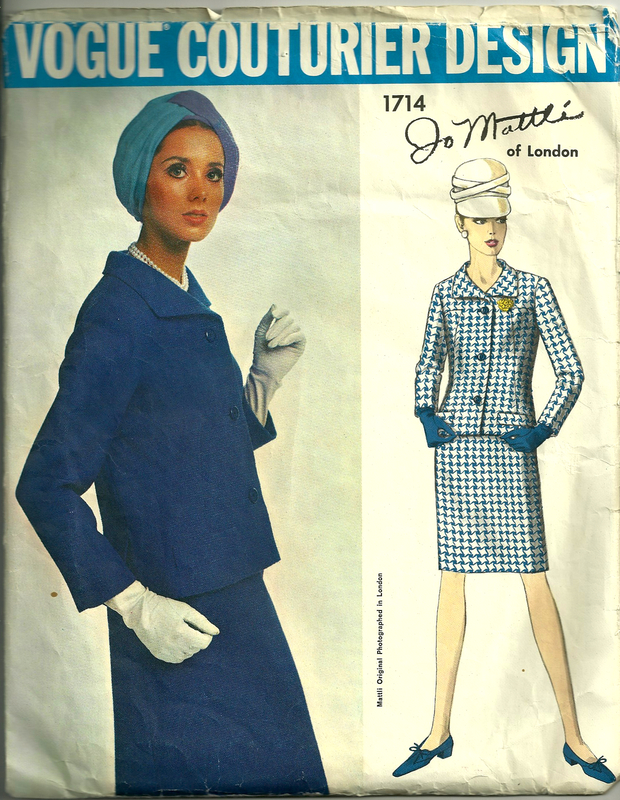 I am probably going to use this 1970s’ pattern for this outfit. Next we selected a lining fabric, enough for a narrow skirt and the jacket. Those of you who know Britex, know that the store is on 4 levels, so to accommodate the need to move between floors, I was provided this card with swatches of my newly selected fabrics attached. The lining is the lighter-colored fabric. Off I went to the third floor to find buttons. Oh, the choices! That little bit of sparkle in the wool – and the sheen in the silk shantung – seem custom made for buttons with a bit of sparkle, too. I kind of felt like Goldilocks looking at the buttons which the savvy “button lady” pulled out for me. Some were too frou-frou for me, some were too round (and fought with the angles in the weave), some were too sparkly… but these were perfect! When I actually sew these buttons onto the jacket, I promise I’ll have them on straight! With my tasks accomplished, I decided to check out the remnants on the fourth floor, and took a quick look at the cottons on the second floor, but then I headed back down to the first floor to look at the woolens again. 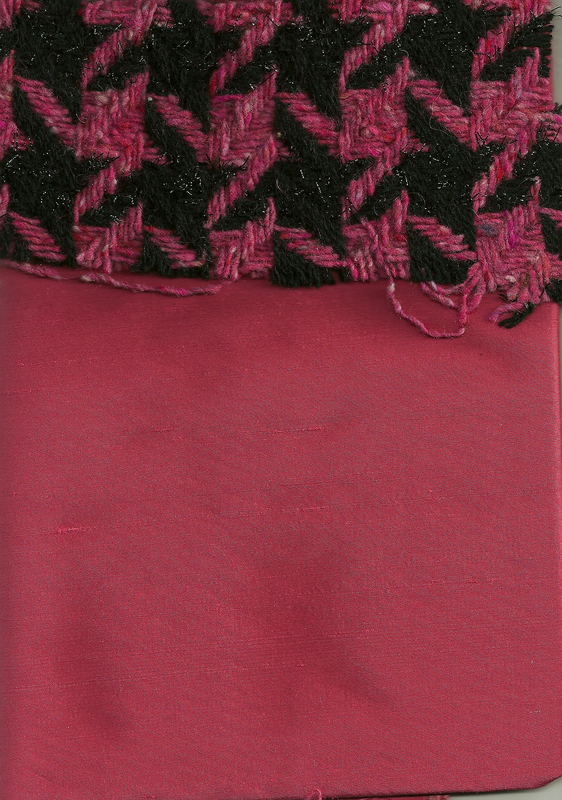 Britex has a very large selection of wools suitable for “Chanel-type” jackets, including some actual Chanel fabrics. I am trying to buy only what I can’t live without (which isn’t as limiting as it should be, unfortunately), so I carefully considered all the selections in front of me. You can probably guess by now that I did indeed find one I deemed necessary for continued life, liberty, and the pursuit of happiness. I can just imagine this wool in a jacket trimmed in an orangey-red something – all yet to be determined, which is, of course, part of the creative intrigue of sewing. 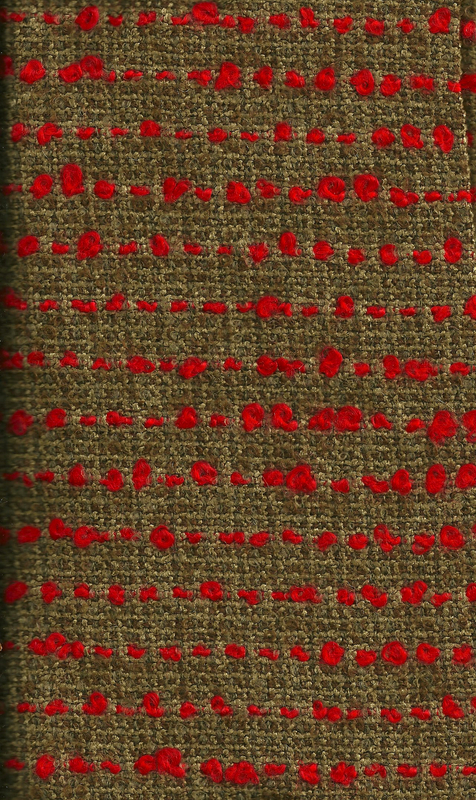 This fabric is very soft, perhaps due to a certain percentage of mohair wool in its composition. So – what about the rest of the trip? Lots of driving those great distances out West, lots of laughs, fun, and brews with husband and son, wonderful days at Crater Lake National Park in Oregon, hiking without a fabric store in sight. When one is in such a place as Crater Lake, the great expanse and passage of time is ever in one’s presence. However, I couldn’t help but think about another passage of time, this one personal: the last time I was at Crater Lake was in 1962 when I was twelve years old. It just so happens that Britex Fabrics celebrated their tenth anniversary that very same year. Happy 60th Birthday, Britex! One more smile before closing hour! That sounds like such a fun trip! Did you spend hours at Britex? You had amazing willpower if you only bought those two fabrics, lining, and buttons! I can’t wait to see your beautiful suit! It was a fun trip! I could spend an entire day at Britex, but only had a couple of hours. My will power was enhanced by the fact that I still have two un-made lengths of fabric from my 2011 shopping excursion to Britex! Thanks, Cissie! Seeing so many beautiful fabrics in one place is really quite amazing! I’m not happy to have our son so far away (in the Bay Area), but it does provide me with this great fabric shopping experience every time we go out to see him! As you know, shopping for fabric is one fun thing to do!! Sounds like you had a great trip, Karen! Britex sounds like Heaven! The exterior of the building is so beautiful, too. There isn’t really anything like it here in Australia. If I ever get to San Francisco it will be a must-visit. That pink and black suit is going to look so glamorous and luxurious, and spending all of the time to make it is worth it when using such high quality materials. I also enjoyed your earlier post on your vintage cape. Actually, I found your blog via Pattern-Vault’s recent cape post. Great blog, Karen. I’m following! I am so glad to know you found my blog – and are following!! Thank you! It’s clear we share a great appreciation for vintage Vogue Designer patterns. They are just the best in my opinion – and so much fun to sew from. Now you have an incentive to get to San Francisco! I can’t recommend Britex highly enough. Hi, I have just found your blog and I’m so glad I did! 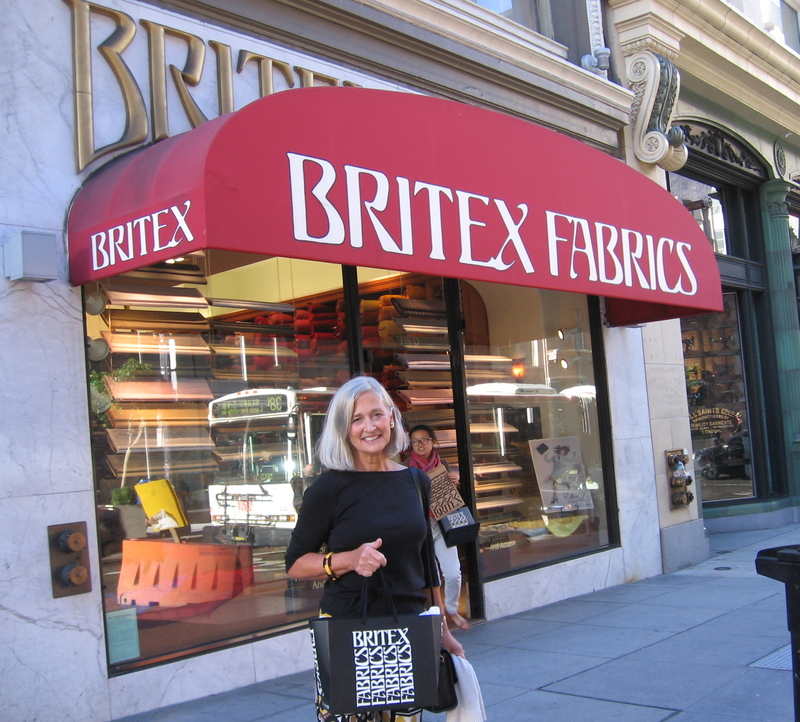 I’m from the UK and could not miss out on visiting Britex Fabrics when I was in SF. That store is AMAZING! Looking forward to catching up with your posts! Thanks so much for your comment, Kati! So glad you made it to Britex – I would be in big trouble if I lived close to Britex! As it is, I get there once or twice a year (it’s across the country from where I live! ), although I do look at their website frequently! I am sure you will get to Britex one of these days! Of course, it’s also fun to shop online at Britex – just takes a little longer when swatches are necessary. Happy Fabric Shopping to you! Online! Off course that is what I must do. Stay tuned…….